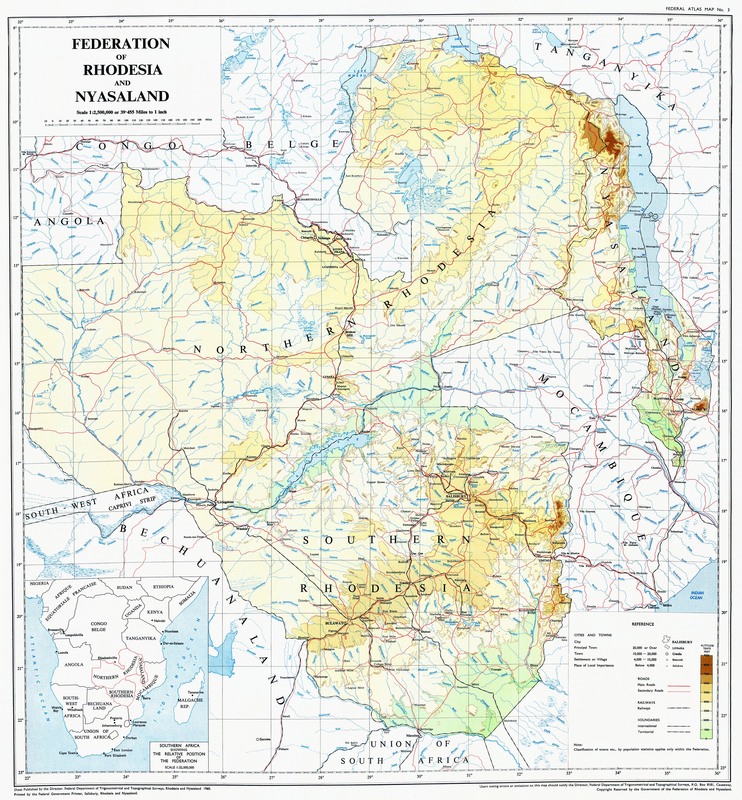 The developed areas of Northern Rhodesia were the Copperbelt in the North, where all the important mines and ancillary activities were situated; the Midlands, consisting of rich farming and ranching land from Ndola down to south of Lusaka, the Capital and seat of Government, and thence from Kafue to Livingstone, a savannah type of country with ranching and agriculture, mainly maize and tobacco. All the important towns straddle the railway line from Livingstone in the south to Bancroft in the north. The countryside from the Zambesi in the west to Portuguese East Africa in the east (with the exception of a small developed pocket around Abercorn and Fort Rosebery) was virgin territory sparsely populated and with large open spaces. This hinterland was shared among about twelve labour officers dotted along the line of rail. With such vast areas to administer it was incumbent on labour officers to visit them from time to time to keep in touch with the hinterland. Normally these tours were leisurely and pleasurable affairs as they were partly intended to give officers a break from the office routine. The usual procedure was to draw a suitable vehicle from the PWD pool, alert a member of his staff to accompany him as interpreter and then to proceed on his business calling on District Officers en route (a standing courtesy paid for invading or traversing their domains). If an overnight stop was necessary there was always a rest house available with a capitao (caretaker) in charge to provide a meal and a clean bed. It was in 1956 when I had been posted to Livingstone after a serious illness on the Copperbelt that I first heard about "The Mongu Walk". By the sound of things this was no ordinary tour but more a trial of physical strength against the elements of nature! The tour involved several modes of travel namely rail, foot, air, road and finally river transport. The whole tour took about a month to complete. Northern Rhodesia, Southern Rhodesia and of course the Gold Mines on the Reef were all reliant on migrant labour as their own labour was usually employed in industry and agriculture which were regarded as being more stable. Migrant workers originated from territories around the Zambesi and travelled on foot to the nearest depot in Mongu from where they were conveyed to their chosen destinations. Two labour organizations operated along the Zambesi, namely WENELA for the South African Gold Mines and Ulere (meaning "free") sponsored by the Southern Rhodesia Government. Both of them provided free transport, rations and accommodation for anybody wishing to be employed in their respective territories. 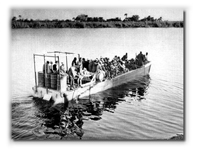 Road transport was provided as far as Sesheke on the Zambesi and then from Katima Mulilo in the Caprivi Strip to Mambova just north of Livingstone and Chobe in Bechuanaland by motor launch. For those migrants for whom Mongu was too distant the only alternative was to footslog it to Livingstone and it was for this category that the Mongu Walk catered. The walk was for most part through inhospitable terrain, very sparsely populated. 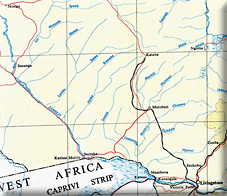 Consequently the Northern Rhodesia Government had established a series of camps from Mulobezi just north of Livingstone to Mongu which provided overnight accommodation for travellers with cooking facilities safe from marauding lions and with capitaos in charge. The rest camp buildings were constructed of pole and dagga, a term commonly used to describe a frame of wooden poles plastered with mud under a roof of thatch. It is obvious that the lifespan of such buildings in a land teeming with termites was limited and it was necessary to inspect them annually, a trip undertaken in winter. Any construction work necessary was done by the Labour Assistant in a follow-up operation. From the foregoing it is clear that a fair amount of planning and preparation for the trip was necessary as the walker would be out of touch with civilization for a number of days with only his portable radio to receive the news and the odd sporting events. Firstly he would draw such items as a folding chair, hand basin, bath and a tent from the Stores Department. From a Provincial Medical Officer he would obtain a well-equipped first aid kit plus medicines and pills for minor ailments and injuries. Fortunately the porters for the walk were a hardy lot and made few demands for treatment. The village headmen along the route however knew about the box and its contents and in the late afternoons they and their families would receive treatment for ailments real and imaginary. Sometimes a chicken would change hands. Rations for the party would have to be purchased; these were doled out every evening by the head messenger in charge of the porters. Lastly he had to provide for his own needs as no shops would be encountered en route during the 10-12 day walk. It was essential to prune requirements to the minimum to keep the loads of the porters within allowable limits. As meat was the major item on their diet, a suitable gun for hunting was a necessity. The assistance of the District Commissioners stationed at Sesheke and Nangweshi along the Zambesi was vital. The first detached one of his head messengers to recruit 25 porters and then to accompany the party to Mongu from Mulobezi where the actual walk started. The second was asked to deposit bags of cassava meal at rest camps on the way to augment supplies running low. It was also prudent as part of preparation to strive to attain a certain standard of personal fitness and a daily walk was a good investment as embarking on a walk of approximately 150 miles would be foolhardy without doing so. Lastly suitable footwear was very important. Bata produced rope-soled boots with canvas uppers which were ideal as they were light and drained quickly after fording the numerous streams, and the soles acted as cushions in the soft Kalahari sand. Seemingly frail they stood up well to the harsh conditions of the walk. The reason for doing the tour in winter was to allow the marshy areas swollen by the summer rains to subside and become fordable and of course to take advantage of the cooler weather. Although intended mainly for migrant workers these rest camps were also used by other travellers such as fishermen taking advantage of the dry season to fish for catfish in the marshy areas adjacent to the Zambesi river. These were then dried and smoked over fires and later sold in towns along the Copperbelt. It was from their ranks that most of the 25 porters required for the walk were recruited by the head messenger from Sesheke. They were willing workers as they not only earned a wage but were given a daily food ration according to a scale laid down by Government. On arrival at Mongu they were paid off as their services were not needed for the rest of the journey. Although the tour was termed a walk, much of the travelling was by other means. The first 70 odd miles were by train reminiscent of a Heath Robinson cartoon from Punch of the early 1930s. Its main purpose was to convey logs cut at Mulobezi to the Zambesi Saw Mills in Livingstone. It was therefore made up of a number of open trucks with a guards van at the back, big enough to accommodate the Labour Officer and his personal staff. It contained a wood burning stove and a truckle bed. The truck was still marked "ZAR" (Zuid-Afrikaansche Republiek) indicating that it was a relic of the days of Paul Kruger and the Boer War. The rails on which the train ran were not of equal thickness or length. So instead of a sleep-inducing clickety-click the passenger was tossed from side to side like in a ship on a stormy sea. On arrival at Mulobezi I was met by the head messenger and the porters. After my katundu (goods) was unloaded it was divided into individual loads not exceeding 50 lbs per porter. The walk proper commenced the following day. The first day, despite all preparation, was long to be remembered. The soil underfoot was a Kalahari sand pounded into a fine dust by thousands of marching feet into which the walkers' feet sank almost ankle-deep. It sifted into my socks and the ensuing abrasions caused blisters which eventually broke. My feet were in such a bad state that the head messenger considered constructing a machila, a rude chair mounted on two poles to be borne by four porters. However, I decided to declare the second day a rest day and for the whole day I soaked my feet in a hot, strong solution of permanganate of potash. This hardened the blisters and the following day I was roadworthy again. Although I looked like a pied noir from French Algerian colonial days, I was saved from the humiliation of being carried on the "walk"! With the rigours of the first day behind one, matters became easier as feet and muscles hardened. I walked behind the head messenger so closely that when his foot lifted mine plopped into the hollow. Sometimes he would stop up short and my nose would land between his shoulder blades. Once started and as the muscles hardened the walk developed a rhythm of its own. Distances between stops varied from 10 to 18 miles and starting times were planned to allow travellers sufficient time to attend crimp duties and prepare for the approaching night. To kill time while walking I would count the number of flies on the head messenger's sweat-soaked tunic and multiply this by the number of walkers to estimate the number of unauthorized "migrants". Fortunately the porters were well versed in the drill of pitching camps which involved the tasks of pitching my tent, preparing a "loo" and a table made from forked sticks and cross pieces to form the table top. A fire was started in front of the tent by the simple expedient of placing four big tree trucks end-on and feeding them into the fire. This was the task of two carriers who slept next to the fire. The resulting heap of embers warmed the inside of my tent and boiled a kettle for coffee in minutes. A bath would be filled with hot water and after a bath there was an opportunity to relax in a folding chair with a cooling drink while something sizzled on the fire. If fortunate the travellers might be able to watch a fisherman in a dugout fishing for bream with a spear, the point of which was a mass of barbs, or he might be entertained by village dancers. I was surprised to find on paying a sentimental visit to the Victoria Falls a year or so ago, a group of dancers performing the Luchichi dance, albeit it a watered-down version which was seen on the Mongu Walk some 53 years previously. This was an existence fit for a king and the hardships of the day were soon forgotten. No wonder I volunteered to do the walk a third time! However this was vetoed by the then Deputy Labour Commissioner Roy Philpott. I found out later that he had done the trip three times - a record he was not prepared to share! The marchers were accompanied by the throbbing of drums as the progress of the walk was reported forward. Looking at the string of walkers the Labour Officer could be forgiven for casting himself into the role of a latter day David Livingstone who, for all one knew, might have followed the same route on one of his many explorations. So good were the drum signals that the District Commissioner at Mongu was alerted in time to meet the Labour Officer with transport for the final few miles of this final stretch. This final lap was most difficult as the marshy areas on the Zambesi river banks had not drained sufficiently and the walkers had to slosh through long stretches of muddy water in some places thigh-high. After a short rest a visit to Kalabo on the Zambesi flood plains followed. This is the site of the Barotse Paramount Chief's winter residence. Here I met an ex-RAF WWII pathfinder fighter pilot-turned-bargebuilder! The final trip by launch from Katima Mulilo to Mambova was the "cherry" on the top although it was not without its hazards as some years later a boatload of migrants died when a boat travelling at speed was engulfed by the stern wave when the engine suddenly failed. Major Trollipe's sister was an excellent caterer and she provided a hamper for the by-now starving Labour Officer. With hamper, fieldglasses, gun and folding chair, I settled on the steel canopy of the boat to enjoy a game viewing ride next to none as the Zambesi river and banks teemed with wildlife. All too soon Mambova hove into view and then it was home and the inevitable preparation of a tour report for headquarters. In the earlier days Major Trollope had been in the South African Government Service as a Native Commissioner stationed at Katimo Mulilo in the Caprivi Strip which bordered on Northern Rhodesia, South West Africa and Bechuanaland. That area is known for the size of its baobab trees. These trees as they grow older develop hollows in their stems. 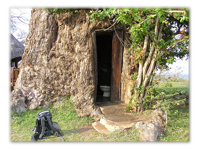 This peculiarity was exploited by the Major who enlarged the cavity in the trunk of a massive tree near his back verandah and ended up by constructing a "loo" with indoor sanitation. He fashioned a door of baobab bark that fitted so well that it was barely noticeable to the naked eye. It was rare entertainment for guests "in the know" when a newcomer who "had to go" was shown the garden pathway which brought him up against the base of the tree! Trollope later left the Union Government and joined the Ulere labour organisation in Southern Rhodesia.